From provocative peeks into the lives of jockeys, trainers, owners, and breeders, to the down and dirty doings of bookies and gamblers, here is a literary tribute to a favorite national pastime. Editors Maggie Estep (Diary of an Emotional Idiot; Flamethrower) and Jason Starr (Twisted City; Lights Out) have brought together original fiction and nonfiction from some of our most beloved writers. Lee Child heads off the collection with a thrilling story about a hit man hired to knock off a horse mid-race. Laura Lippman contributes a vivid tale about a young man who makes money selling parking places at the Preakness and the intriguing woman he meets. Here is Bill Barich on the misfortunes of an Irish gambler, Joe R. Lansdale on one man’s ambition to win a mule race in east Texas, Laura Hillenbrand on the Kentucky Derby, and James Surowiecki on the wisdom of horse-racing crowds. Jonathan Ames adds his unique theory of horse love, Meghan O’Rourke shares her touching recollections of going to Saratoga as a child, and Jane Smiley tells of her experiences raising thoroughbreds. 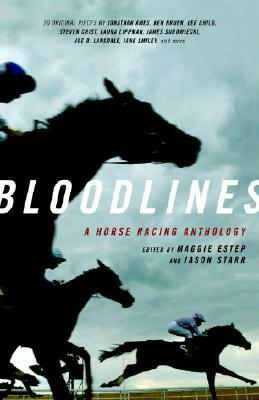 This standout collection on horse-racing featuring twenty authors, from national bestsellers to Pulitzer Prize winners, is as page-turning as it is diverse.Also includes pieces by Ken Bruen, Steven Crist, Maggie Estep, William Nack, Scott Phillips, John Schaefer, Jerry Stahl, Jason Starr, Charlie Stella, Wallace Stroby, and Daniel Woodrell. Maggie Estep has worked as a horse groom, a go-go dancer, a dishwasher, a nurse's aide, and a box factory worker. She has published five books, Diary of an Emotional Idiot (1997), Soft Maniacs (1999), Love Dance of the Mechanical Animals (2003), Hex (2003, a New York Times notable book), and Gargantuan (2004). She has recorded two spoken word CD's, No More Mr. Nice Girl (1994) and Love is a Dog from Hell (1997), and has performed on The Charlie Rose Show, MTV, PBS, and HBO's Def Poetry Jam. Her writing has appeared in The Village Voice, New York Press, Harpers Bazaar, Spin, Black Book, Nerve.com and Time Out N.Y., as well as in dozens of anthologies including Brooklyn Noir, The Dictionary of Failed Relationships, The Best American Erotica 2002 and 2004. She lives in Brooklyn, New York. Jason Starr is the author of six crime novels which are published in nine languages. He received the Barry Award for his novel Tough Luck and the Anthony Award for Twisted City. He has two novels due in 2006: Lights Out (St. Martin's Press) and Bust (Hard Case Crime) co-written with Ken Bruen. Born and raised in Brooklyn, Starr now lives in Manhattan.